The Singapore Writers Festival has just ended. I was a "Featured Author" (that's the term they use) for an event on the last day. It was a panel discussion at the National Museum. The other panellists were Pat Law and Yu-Mei Balasingamchow, and the moderator was Dr Gwee Li Sui. The session was provocatively entitled "Why Facebook Killed The Blogger". When I first showed up at the venue, it struck me as rather large. I had expected a smaller venue. To my surprise, people streamed in steadily and the seats were filled up pretty quickly. It was almost full-house by the time we got started. I didn't do an exact count, but I estimate that about 100 people showed up for our one-hour discussion (which was about writing on the Internet). I spotted a number of other writers in the audience, including Felix Cheong, Chris Mooney-Singh and Dave Chua. The audience was very lively during the Q&A session, and the questions came thick and fast. There were questions about whether the popularity of Facebook was rendering the blogging platform obsolete; and the importance of writing quickly about hot topics in order to get high readership. It was an interesting session, and we eventually ran out of time. I didn't get to respond to all the questions as thoroughly as I would have liked, but I guess that was somewhat inevitable. The National Arts Council paid me $250 for my time, which is nice because I do several talks in different capacities on different topics every year, but I rarely get paid. The guy standing on the left of the billboard is Aaron Lee. Mr Wang is one of the folks shown on the billboard itself. So last Tuesday night, I found myself back in my old secondary school. At least that's what it's used to be. 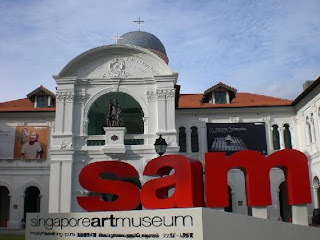 Today it's more commonly known as the Singapore Art Museum. I had a few small moments of nostalgia, wandering through its hallways trying to figure out where the school canteen and the P.E. room used to be. 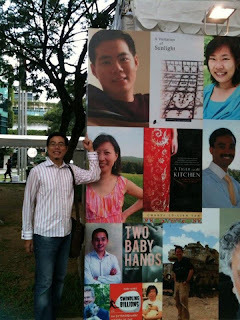 I was there for the 10th anniversary celebration of the Quarterly Literary Review Singapore, held in conjunction with the Singapore Writers Festival. QLRS is a website founded by my friend and fellow writer Toh Hsien Min which over the past decade, has published a rather impressive collection of poems and prose from many writers, both local and foreign. The poem is about Lee Kuan Yew and one of his pet projects - the greening of the Singapore cityscape. At the same time, the poem also alludes to his vast power and his grip on the country, and reminds us of the extent of social engineering that goes on in our interesting little island-nation. Several developments on the creative writing front, for me. Firstly, the Straits Times and the National Arts Council have invited me to write a children's poem, for publication in the newspaper. It would be part of a series to promote little kids' interest in reading and writing. This is quite a new thing for me, as I have not written for children before. But I figure I'll give it a shot. I have promised to deliver a limerick or a nonsense poem - not the kind of writing I would normally do, but I think that this would be fun for kids. Next, my publisher tells me that he's in the midst of negotiating a contract with Singtel. I'm not too clear on the details yet, but it's got to do with Singtel wanting to purchase Singapore creative writing for an e-platform that it will be launching. If this works out, then some Singapore writers' poems and short stories - including mine - may soon become downloadable on your iPad, iPhone or other smartphone. Also, on 25th October, I'll be reading some poems at the 10th anniversary celebrations of Quarterly Literary Review Singapore. QLRS is a well-known literary website in Singapore, manned by a team of editors including Toh Hsien Min, Yeow Kai Chai and Cyril Wong. Unlike many other short-lived wannabes, QLRS has actually succeeded in staying alive for a decade, regularly publishing poems, short stories and book reviews. Very commendable, and I'm pleased and proud to participate in their upcoming event. A few days later, on 30 October, I will be a panelist on a discussion entitled "Is Facebook Killing The Blog?". This event is held in conjunction with the Singapore Writers Festival. Feeling a little unsure about how this particular event will pan out, but what the heck, I'll just go and fearlessly give my two cents worth. Perhaps most interestingly of all, my publisher tells me that he's been approached by HDB and NAC, concerning one of my poems. Apparently, the proposal is to use this poem to decorate a new HDB block somewhere in Sengkang, together with a mural by award-winning comic-book artist Sonny Liew (who will paint something to illustrate his interpretation of my poem). Now, that would be something really new and fun for me - to see my poem with a painting, up on a building wall. Hey, look who's right over here. Me. Okay, that is not really the point. The point is that the Singapore Writers Festival is coming up soon - in the last week of October (from the 22nd to the 30th), and there will be many interesting events for those of you who like to write, as well as those of you who like to read. The writers participating in the Singapore Writers Festival include the usual suspects from the local scene (Catherine Lim, Alfian Sa'at, Ho Minfong, Edwin Thumboo, Toh Hsien Min, Dave Chua and SuChen Christine Lim, to name a few). And there is also a generous dose of foreign authors including Francis Lelord, Joe Haldeman and Steven Levitt. 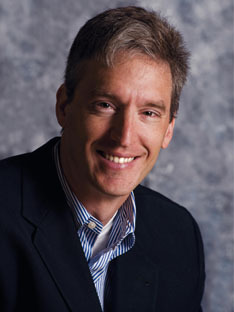 Stephen Levitt, author of Freakonomics and Superfreakonomics. The Singapore Writers Festival includes events such as lectures, writing workshops, panel discussions, meet-the-author sessions, book launches and more. For full details, visit the SWF official website.